The sound of your acoustic guitar is a team effort. Construction, hardware, neck shape - the list goes on. But arguably the most important component is the top wood; in this article, we'll delve deeper into the difference between solid tops and laminate tops. Read on for the full lowdown! What is an acoustic guitar top? Tonewood has always played a major part in guitars, and indeed musical instruments in general. With electric guitars, the wood used plays a major role in the sound, alongside pickups, hardware, electronics and so on. But when it comes to acoustics, tonewood is the star of the show. The neck, fretboard and body of an acoustic guitar can be made of different woods, each one complementing the other. But many argue that the most important component of an acoustic is the top, also known as the soundboard. As you may have guessed, this is the piece of wood on top of the acoustic, often the first thing you’ll see. It’s one of your guitar’s first points of contact with the strings – their vibration reaches the rest of the guitar via the top wood. It’s also the home of the bracing and the soundhole, both of which ultimately help to shape the sound of your instrument. What is a solid top? A solid top is essentially a single piece of wood. This piece of wood has been carefully picked, carved, shaped and fitted, but remains a single piece – from source to instrument. You’ll know if an acoustic has a solid top by looking carefully at the soundhole; because the soundhole has been cut into the wood, you’ll be able to see a cross section of the grain when you look at the edge (see image below). Occasionally, the solid piece of wood is divided into two and mirrored – you’ll notice a distinct divide in the middle of a guitar top when this is the case. What is a laminated top? As the term may suggest, a laminated top is made of more than one piece of wood. These much thinner layers are joined together using a combination of heat, pressure and adhesives, depending on the manufacturer. This process is a fairly common practice, as it allows a manufacturer to increase their output while using less wood. Imagine a single piece of mahogany for an acoustic top vs. dividing that piece of mahogany into 4 laminate layers. You’ve now got 4 acoustic guitars with rich,red mahogany tops, all of which came from a single piece of wood. What this also allows is the use of cheaper materials to make up the rest of the laminated wood. Because you can’t see what’s underneath the top layer, it could be anything from maple to plywood to plastic resin! If you look at the soundhole below, you can just about make out the different layers of wood – the grain from the top doesn’t continue all the way through. The term veneer is often used to describe the top (or visible) layer of laminated wood. While the layers underneath might consist of cheaper/composite materials, you still want it to look good. As mentioned above, manufacturers will take a nice-looking (and thin) layer of Mahogany, Maple, Koa – whatever takes their fancy – and apply it to the top of the laminated wood. This ensures an organic appearance but uses less wood and a less complicated process. We’ve established that one of the main reasons a guitar maker might use a laminated top is to ensure that their instrument looks great, but uses less wood and is easier/quicker to make. So does a laminate top look any different compared to a solid top? The visual difference between laminated and solid tops is a divisive issue for guitarists. Many argue that the difference is marginal, as it’s essentially the same wood being used, except veneers are thinner. 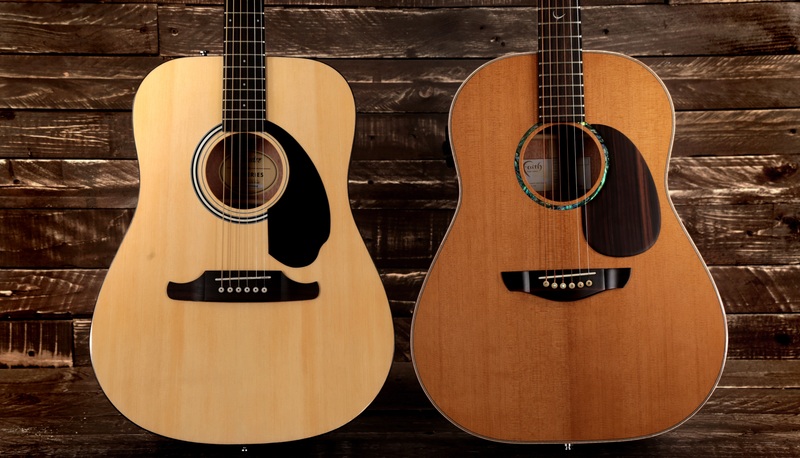 Either way, the wood is picked because it looks great – you’ll rarely see a flawed top on an acoustic guitar! Others argue that a piece of wood chosen for a veneer will be cheaper, and therefore not as pretty – what do you think? Below: a laminate top on the left and a solid top on the right – both are Spruce. The sound is where the debate really heats up. First thing’s first: if you like the sound of something, you like the sound of something, right? Whether it’s American, British, true bypass, buffered…you’re the judge! So, objectively speaking, is there a difference in sound quality between solid and laminated tops? Given the fact that acoustic tops (soundboards) play such a vital role in the sound of your acoustic, we’d go so far as to say – objectively – yes. A solid piece of wood has consistent grain and density running through it. Because of this, you tend to get better sustain and a richer resonance. Different types of wood offer different tonal flavours, but as long as it’s a solid piece, chances are it’ll sound great. More importantly, solid tops can age and will therefore improve their resonance as they get older. Veneers will not age in the same way because it’s a combination of different woodcuts and you won’t get the same effect. The best acoustic guitars in the world use solid tonewoods – it’s as simple as that. But as we said: if you like the sound of something, you like the sound of it. While solid tops offer a more resonant sound, you may simply prefer the sound of a laminate-topped guitar – that part is totally subjective! It’s a well-known fact that solid woods on guitars are more susceptible to change as a result of temperature, humidity and age. Because solid wood relies purely on its own sturdiness and thickness (and its bracing), it can fall prey to cracking, warping and other side effects. If you’re a guitarist who’s always on the move, or for whatever reason you find yourself playing guitar in extreme climates, you may want to consider the implications of owning a solid-topped guitar! Laminates tend to do better in their battle against the elements. Because they’re comprised of multiple layers and go through a combination of heat, pressure and adhesive processes, they’re more resilient. It’ll take quite a lot more than rapid changes in temperature and the odd long-haul flight to do damage to an acoustic guitar’s laminate tonewood. Are solid tops more expensive? For the most part, yes. This is the result of all of the things mentioned previously in this article. If a piece of wood is selected to become a solid top for an acoustic, chances are it’s of the highest quality, in every respect. It’ll look beautiful, for starters, meaning a lengthy selection process with eagle-eyed precision for flaws. It’ll also sound excellent, as we’ve discussed – solid tops are something of a tonal holy grail for acoustic luthiers. Finally, the wood used for solid tops tends to be ethically sourced from a sustainable supplier. This ensures that the wood is of excellent quality, that the trees are in good health and that the company does their bit to protect the environment. We did say for the most part – many manufacturers manage to strike the balance between quality and affordability. Companies like Alvarez, Faith Guitars and Sire understand the tonal importance of top woods, and the importance of making sure every player is catered for. Many of these guitars are well under £1000, each one with its own solid top. This means brilliant sound, stunning looks and a sensible price tag – pretty good deal if you ask us! Well there you have it – by now you’re hopefully feeling more confident in your knowledge of acoustic guitar tops. If you’re after a new acoustic, consider the three main things we’ve discussed in this article: looks, sound and durability. To find the guitar that suits your needs, you need to strike the right balance between these three things! Want to know more about acoustic guitar tonewoods? Check out our full Acoustic Guitar Tonewood Guide!